We are proud to offer our furniture for event rental from our new iconic rental collection. This collection is made up of our well renowned salvaged redwood table tops, comfortably enclosed by a beautiful steel framework, and strongly supported by blackened steel "A" Frame legs. It is truly rustic elegance at its finest. Currently our rental collection is composed of 50 6' x 3' salvaged redwood tables. Each table can individually support 8 people seated comfortably. These tables are modular and can be arranged end to end or side by side offering a variety of seating arrangements that can meet any need. Perfect for parties, weddings, ceremonies, etc. We are also offering rentals from our wine barrel collection as well. Our collection is constantly growing and expanding. If there is something you are interested in renting, please feel free to inquire. Pricing is as follows: $65 per table. $25 per wine barrel. Delivery fees are dependent on location. For more information, please see the rental agreement below. 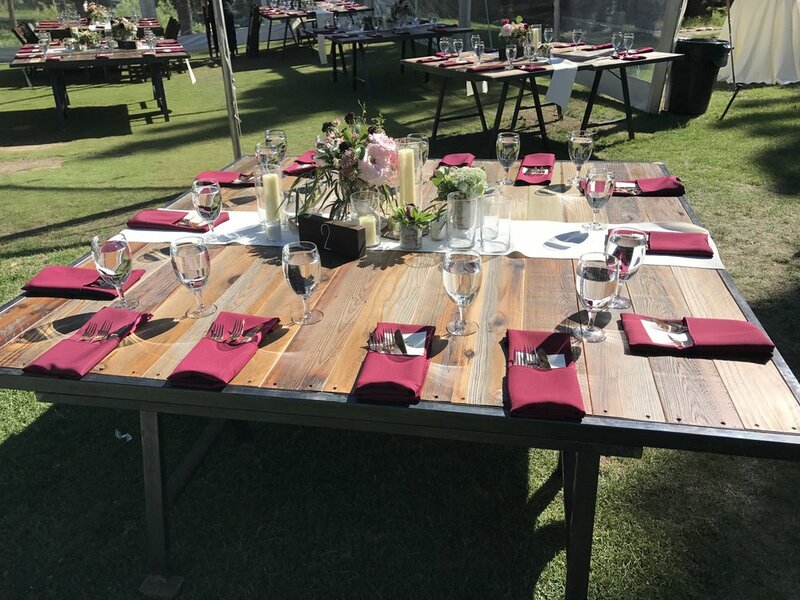 Make a statement at your event with our high end reclaimed redwood tables. Gone are the days of cheap fold-able plastic tables covered with white linens. Let your guests know that they are dining with sustainability. Our unique rental collection is always growing. If there’s something you’ve seen us fabricate that you’re interested in renting, feel free to ask. We’re always open to exploring new rental opportunities. We partner with several local wineries to keep their old wine barrels out of landfills. We frequently repurpose them into tables, sideboards, & stools. 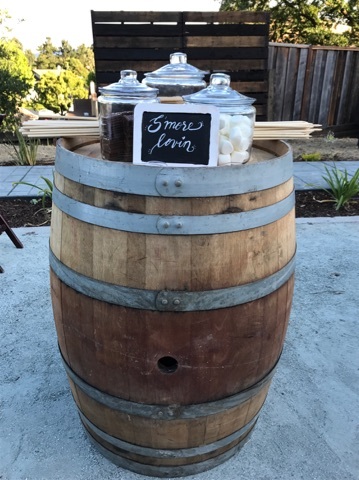 We are proud to offer wine barrels in our rental collection. They can serve many different purposes, and make a wonderful addition to any event.